If you like elephants, this is a terrible idea. A video's been circulating again that shows a tourist in Thailand receiving an elephant massage - he lies in a lounge chair as two young elephants slap at his back with their trunks and pat him down with their feet. Videos of elephant massages have been around for several years, and media outlets have touted the experience as a fun vacation activity. One Thailand elephant camp, the Mae Ping Elephant Camp, advertises that its elephants play musical instruments and soccer as well as giving lucky tourists the chance to be massaged. 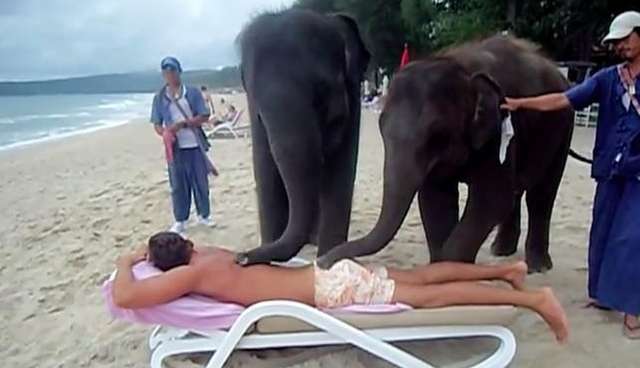 Unfortunately, the truth behind elephant massages isn't nearly as attractive. 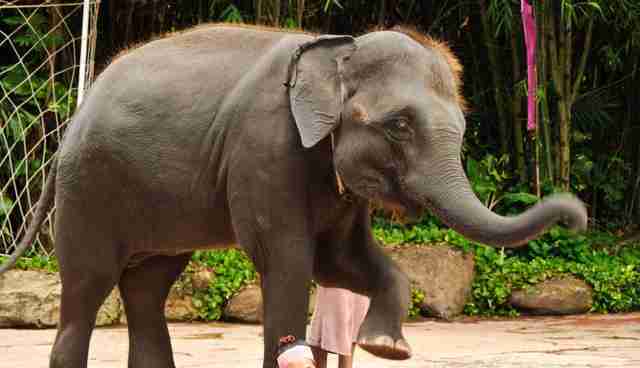 Like almost all trained elephants, the animals featured in most of these tourist attractions are stolen from their mothers at a young age and subjected to brutal training procedures designed to crush their spirits. The practice is known as a "training crush," or "elephant crush," and can involve stabbing or injuring the baby elephants, locking them in small cages and subjecting them to starvation, thirst and sleep deprivation. Sometimes they don't make it. At the end of the experience, the orphaned elephants are left broken and dispirited - in other words, pliable enough for their trainers to tell them what to do, like making them massage tourists. Many mahouts, or trainers, will also use bullhooks to keep the performing elephants in line - sharp instruments used to jab the elephants if they misbehave. And it's not just massages. Nearly any elephant used in tourism - including those used in elephant rides, or even U.S. circuses - have been subjected to some sort of training crush designed to make them obedient. "Tourists may think activities like riding an elephant do no harm," Dr. Jan Schmidt-Burbach, a senior wildlife and veterinary adviser at World Animal Protection, told The Dodo earlier this year. "But the brutal truth is that breaking these animals' spirits to the point that they allow humans to interact with them involves cruelty at every turn." If you care about elephants, it's best to avoid any attractions that feature rides, performances or other unnatural behaviors, particularly in Thailand and other Asian countries. However, that doesn't mean you have to miss out on seeing these iconic animals up close. Elephant Nature Park is a sanctuary and rehabilitation center in northern Thailand for elephants rescued from the tourism and agriculture industries. The park allows visitors to observe and even interact with the rescued animals - but at the elephants' own pace. Click here to find out more about visiting them. They also do a lot of work to rescue elephants who've survived training crushes and lives of hard work. If you'd like to support their efforts, you can contact The Serengeti Foundation, a U.S. group that provides support to the park, and ask for instructions on donating to the Elephant Nature Park.